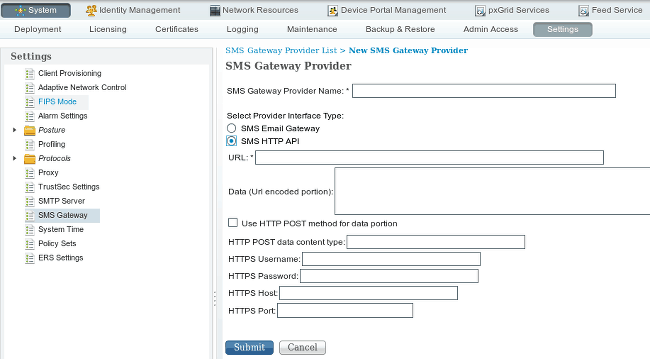 Here we describe how to setup Cisco ISE with SMSEagle for SMS notifications. Cisco ISE uses HTTP API requests (see details: API). All configuration related to SMS Gateway settings messages is done from the System -> Settings -> SMS Gateway page. SMS Gateway Provider page will be displayed. where SMSEagle_IP is gateway’s IP address and login and pass are username and password for SMSEagle user you just created. The username and password to the SMSEagle must be included in this link (unfortunately, clear text is used). The mobile number is taken automatically from the Phone number field during the guest creation exercise from the Sponsor portal. The message field is filled automatically from this location: Sponsor portal > Portal Page Customization > Notify Guests > SMS notification > Message text.